We're having a girl!!! No name yet, but at least we can say she instead of it/he/she/George/the baby...she's officially a she!! We'll update later with pictures from the ultrasound and a name when we have one. She's also very healthy and looks great - and very cute, but I guess I'm a little biased...but she really is cute, so whatever. For anyone who actually reads this blog and doesn't know our big news, we're having a baby!!! 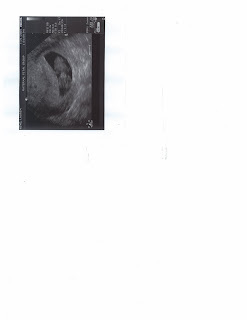 Baby George (my dad named him/her) is due in February and I'm a little over 14 weeks along. We're so excited! I'll post again next week when we find out what we're having (if George cooperates that is!) Here's our last ultrasound at 10 weeks. In other news, I have a new job as a Pediatric Nurse Practitioner starting in late September and I'm very excited. Our house finally sold after 19 months and we found a house to rent for now in Spring Hill, TN. Oh - and I graduated! Lots of good news and a lot to celebrate!